NEBR: Smith 20-123, DuBose 8-104, Rathman 11-52, Miles 8-41. UCLA: Danny Andrews 8-32, Bryan Wiley 4-19. NEBR: Swanson 3-33, Scott Kimball 2-21. UCLA: Andrews 7-52, Mike Sherrard 3-37, Derek Tennell 3-16. Nebraska made its first Rose Bowl appearance in 44 seasons and the No. 1-ranked Huskers made the most of it, turning in by far their best early-season performance in rolling to a 42-3 romp over eighth-ranked (AP) UCLA in a game televised to nearly all of the nation by CBS. The Huskers sacked Bruin quarterbacks eight times as Nebraska handed the two-time defending Pac-Ten and Rose Bowl champs their worst loss in 14 years. 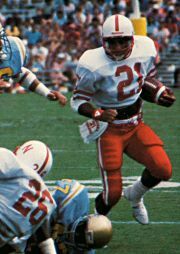 But in recording their first win ever in California, NU lost I-back Jeff Smith to a first-half ankle injury that was to plague him most of the season.